What better way to start my new blog than with breakfast. 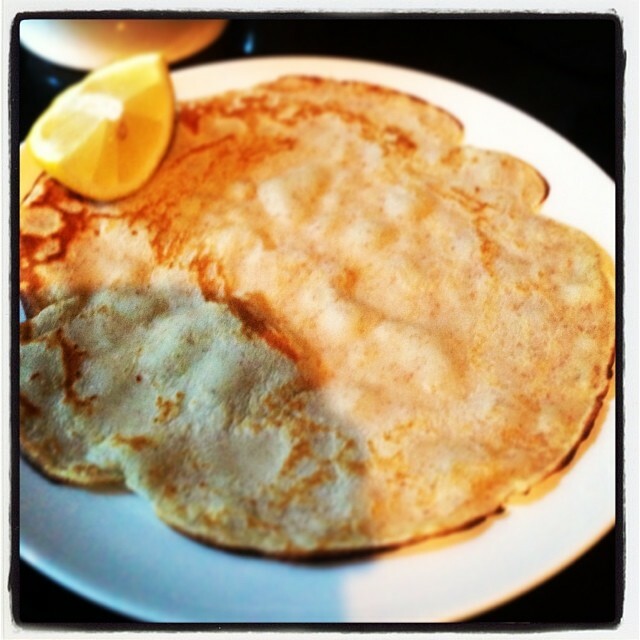 And one of our favourite breakfasts in our family is pancakes. Not so much the doughy, thick American or Scotch ones, but the thin, crispy, crepe kind with a squeeze of lemon and a sprinkle of sugar. These pancakes, made with a mix of buckwheat and wholewheat flour, have a delicious nuttiness, and are lower GI, although the kids didn’t even notice that they weren’t made with ‘ordinary’ flour. Normally, pancakes are the preserve of lazy weekend breakfasts, but last Monday I woke up ridiculously early, my body-clock still on Turkish time after a week away, and we’d run out of bread for breakfast. So I mixed together some of this super-easy pancake batter, let it rest for half an hour, and the kids had them ladled and flipped in less time than it takes to make a bowl of porridge.